Joakim Noah has all the genetics a man could want, but this Chicago post player is still one of the hardest-working men in the NBA. You are an NBA shooting guard, and this is what you live for: final seconds, tie game, the ball in your hands. You pass on a jump shot and beat your man off the dribble into the paint, looking to dunk. The center slides over and you envision him on a poster. Seconds later, you realize the error in your judgment as 6-foot-11 Joakim Noah sends you and the ball crumpling to the floor, stuffed. Size matters in the NBA, but Noah doesn&apos;t just block those shots because of his height and wingspan, both of which are immense. The New York native is renowned for hustle, hard work, and an uncanny knack for finding the ball. Noah isn&apos;t just another big body who developed a talent for rebounding. Athleticism and physical genetics can be traced back generations in Noah&apos;s family. His father, Yannick Noah, won the 1983 French Open. His mother, Cecilia Rodhe, was named Miss Sweden 1978 and placed fifth in the Miss Universe pageant. Joakim&apos;s grandfather, Zacharie Noah of Cameroon, led CS Sedan Ardennes to the Coupe de France in 1961. They weren&apos;t just all competitors—they were all winners. Noah seems to have been destined for stardom, and basketball gave him his biggest chance to shine. He was born in New York, lived in France for a decade, and then moved back to the Big Apple, where he starred in prep hoops. Colleges took note. No NBA center will go his entire life without getting "posterized," but every block, every dribble-drive gives men like Noah a chance at redemption! He accepted a scholarship to Florida and helped lead the Gators and coach Billy Donovan to back-to-back NCAA titles in 2006-07. Joakim was named Most Outstanding Player in the 2006 Final Four. Three players from those teams were drafted in the top 10 of the 2007 NBA Draft. Noah went ninth that year to the Chicago Bulls. 2013 was Noah&apos;s best season as a pro. He was named to the All-Star and All Defensive teams. In one monster game against Philadelphia, he tallied 23 points, 21 rebounds, and 11 blocks, joining a list of NBA Hall-of-Famers (Olajuwon, Abdul-Jabbar, O&apos;Neal) as the only players to record that particular triple-double. How do basketball superstars stay in elite condition year after year? It takes more than hundreds of shots taken each day. With the help of his trainer, Alex Perris, Noah commits to training year-round. The pair has worked together since 2007, Noah&apos;s rookie campaign. During the season, Noah must stay flexible due to the rigors of games and road trips. "I switch around my training routine a bit," Noah says. "I still hit the weights, but not as hard. I do lots of core training and stretching, plus I work with a specialist who keeps me flexible and limber." In season, Noah makes it a point to do some sort of training 5-7 days per week. He trains with weights twice per week, focusing on compound movements. His cardio is taken care of since he already practices or plays several times each week. He does corrective work with team trainers and practices yoga for flexibility—a top priority for basketball players. He also hits his core 5-7 days per week. After the 82-game season—or more if the Bulls reach the playoffs, and they have every season since 2009—is over, Noah takes a brief break to recover. Then he settles in to a more consistent six-day split under the watchful eyes of Perris. Perris makes sure no two weeks are the same. 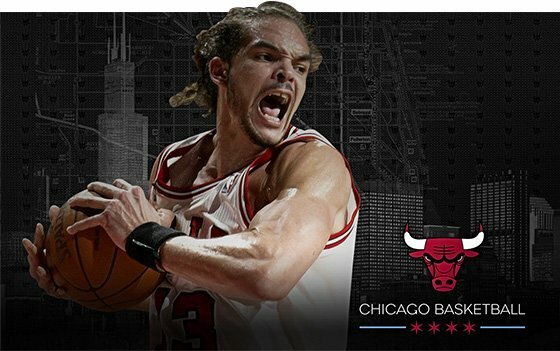 The NBA season is an 82-game grind, so Noah doesn&apos;t lift nearly as heavy as he does in the off-season. Once the season ends, the weight room beckons. Noah&apos;s body has no chance to adapt to anything and it keeps the program from getting boring. Noah does pool workouts with big-wave surfer Laird Hamilton, as well as core, yoga, and of course basketball training. The weights get heavier each offseason, allowing Noah to improve his size and power, so that he can bang under the boards with the NBA&apos;s other giants. "This past offseason, we laid down the foundation with classic compound movements such as deadlifts, squats, bench press, power cleans, clean and press, and military press just to name a few," Perris says. "For conditioning we did a lot of jogging, sprinting, jump roping, and on-court basketball workouts. There are also hill workouts, sprinting with bands, and biking. The results were outstanding. 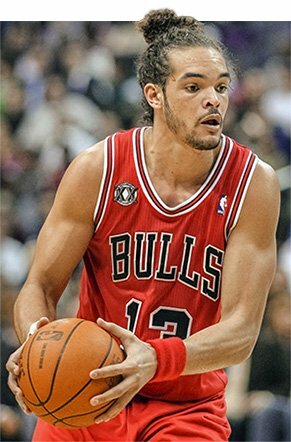 Joakim gained 15 pounds of lean muscle and his strength increased dramatically." When Joakim lifts weights with his trainer Alex Perris, the focus is getting in and out the gym in fewer than 45 minutes. They keep the workouts fast paced and the weights heavy. The workout consists of four supersets, followed by two abdominal exercises. Training is only part of the overall equation. The biggest piece of the muscle puzzle is what you feed the body after your training or game is over. That is the most important moment for your body to take in quality nutrients. Noah relies on Perris to handle both his training and nutrition. Endurance is vital to ballers. If your tank is empty in the fourth quarter, victory will not be yours. "Joakim has a healthy and balanced diet," Perris says. "Joakim will eat 6-8 meals per day with 2-3 of those meals as protein shakes. Protein and good carbs are always high, while fat and sugar remain low. We prepare a lot of fish, chicken, steak, greens, fresh fruit, and veggie juices. For the most part he eats clean, but he occasionally splurges on a cheat meal." Joakim and Alex both rely on BSN supplements to back up their training and to assist with their overall nutritional intake. "BSN Supplements have been a big help to Joakim in a lot of ways," Perris says. "Syntha-6 is a staple we use year-round. Protein shakes are a big part of the diet. During the season they are a great way to keep his calories up. Whether it is post-training or at night, he loves the quality and taste. N.O. Xplode has been great for pre-workouts in the offseason. Cell Mass has assisted his strength gains and muscle addition." 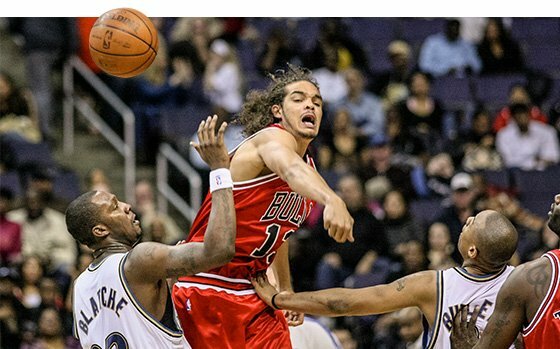 Joakim has to stay strong; he can&apos;t wither when the game&apos;s on the line. "Keeping my calories up is always a concern," Noah says. "Syntha-6 and True Mass have been saviors for me. With my schedule, getting in five daily meals is sometimes impossible. Having my shakes handy has been huge!"